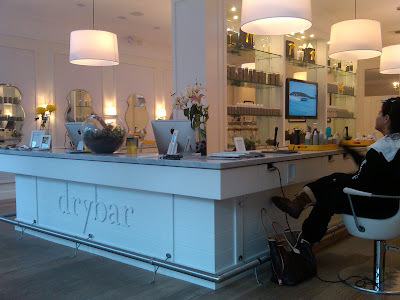 If you're in Los Angeles, I implore you to check out Drybar. The salon specializes in one thing -- blowouts -- and believe me when I say they are masters of their craft. I truly love the salon's philosophy: "No cuts. No color. Just blowouts." I obviously went for the Manhattan, since I like to get my hair as straight as humanly possible. After an amazing shampoo/conditioner/head massage at the shampoo bowl, Tara led me back to my chair and proceeded to give me the BEST BLOWOUT EVER. Seriously, my hair was so pin straight, with not one strand out of place or one frizzy flyaway, it was a true miracle -- especially since it was pouring outside that day! My blowout lasted for three days, which is really saying something since I even traveled from LA to NYC in that time. With my gal Jenny after our fabulous blowouts! And here's the best part. Every blowout is only $35. Yes, $35, regardless of hair type, texture or length! That's the best blowout deal I've found, especially for such an adorable and upscale salon. Another pic of Jenny and me post blowout! For more information and to book an appointment, visit thedrybar.com. Thanks for the directory. Very Very useful. I think it’s a well informatics written post. Its shows the written quality of writer.welldone friend keep it up.